The hero of this intricately plotted first novel is Flapping Eagle, an outcast Indian weary of the immortality conferred on him some 700 years ago by a mysterious elixir. There is, he is told, one haven where he can shed the burden of changelessness: Calf Island. But once there, he finds that the denizens of the islands--also recruits to immortality--have retreated into frozen and change-denying obsession in an attempt to stave off the disintegrating influence of the "Grimus Effect" emanating from the cloudy summit of Calf Mountain, home of the island's maker. 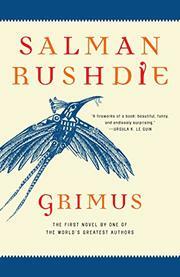 Rushdie unwinds solutions to his various conundrums--involving a misappropriated alien artifact and a plurality of probability-continuums--with inventive wit and an elegant sense of pacing. The story is ultimately overburdened with ingenuities, but for the most part they are real ingenuities. An imagination to watch.